Iran, Jan. 2, 2019 – A large gathering of Isfahan farmers turned violent today after riot police attacked the peaceful protesters marching in the central province’s streets. Around 2,000 farmers gathered this morning on Khaju Bridge in Isfahan to protest the diversion of Isfahan’s river to other provinces. A large number of women were also among the protesters. Videos on social media showed Isfahan farmers chanting, “Today is a day of mourning because farmers have no livelihood”. The farmers, who blame the government for water mismanagement and water scarcity which has all but destroyed their farmlands also chanted “shame on the deceitful government.” Riot police were dispatched to the area from the start of the gathering. Videos from the gathering showed a large number of riot police on the scene with scuffles between police and the farmers. The farmers addressed the police and chanted, “Do not support the thieves”. The protesters also booed the police and chanted “bisharaf”, a Persian curse word meaning “dishonorable”. Reports also indicated that riot police shot bullets in the air to disperse the protesters. Background The Zayanderud River once watered this region, flowing down from the Zagros Mountains, through the city of Isfahan providing water for farming towns. But it dried up years ago. Government policies have worsened the strain from drought and growing population. Authorities have increasingly built factories, sucking up large amounts of water. Water has also been diverted to other regions. “The water cycle has been annihilated. The entire water of the river has been allocated to industry,” said an Isfahan environmental activist in July. An Isfahan official who recently called the farmer’s plight a “catastrophe” said that some the people who were once wealthy, were currently so deprived and poverty stricken that they were covered by relief foundations such as the Emdad Foundation. The representative of Falavarjan at the Isfahan Islamic Council blamed the farmers’ woes on the Ben-Brojen Plan, which incorporated providing a huge water supply to large industrial factories, the use of the water for other areas and many other decisions that resulted from mismanagement. Environmentalists have for years been setting off alarms about the threat of droughts in Iran which stems from mismanagement, the excessive use of groundwater sources, and the construction of a large number of dams primarily carried out by companies affiliated with the Revolutionary Guards Corps. The latest official numbers say that in the provinces of Fars, South Khorasan and Isfahan, groundwater sources have dried up while dam reserves were 25 to 50% lower than last year. August 1, 2018 – The people of Isfahan rallied to protest against the Iranian regime’s corruption and the declining economic situation for the second consecutive day on Wednesday. Anti-regime protests in Isfahan continue to this hour. According to videos obtained from the city, the protesters are chanting, “Khamenei, shame on you. Let go of your rule,” a direct challenge to Supreme Leader Ali Khamenei, the highest authority in the Iranian regime. Thick columns of smoke are rising from different parts of the city as protesters have set vehicle tires ablaze to counter the effects of tear gas fired by security forces. The streets are strewn with rocks and bricks where protesters have clashed with the regime’s repressive forces. Locals reports that anti-riot police are afraid to engage in heavy clashes with protesters and in some regions they have retreated when faced with the resistance of the angry demonstrators of Isfahan, who have taken to the streets because of the dwindling economic situation and the widespread corruption of the Iranian regime. Tensions continue to rise in Isfahan as protests that started this morning stretch into the afternoon. Clashes between protesters and security forces continue in various parts of the city. Protesters are chanting anti-regime slogans including “The enemy is right here. They’re lying that it’s the U.S.” This is a direct reference to the regime’s media propaganda that tries to blame the country’s economic woes on foreign powers. The protesters of Isfahan are also calling for solidarity and resistance against the regime, chanting, “Don’t be afraid. We’re all together.” Protests continue to rage in Shapour-e Jadid, Isfahan. Security forces have tried to control the situation by firing tear gas at protesters. The protesters have set tires ablaze to counter the effects of tear gas and the protests continue. Protests continue to rage in Shapour-e- Jadid, Isfahan. Security forces have tried to control the situation by firing tear gas at protesters. The protesters have set tires ablaze to counter the effects of tear gas and the protests continue. The Iranian regime’s repressive forces are reluctant to directly clash with protesters and are keeping their distance. The number of protesters in Isfahan has reached in thousands. During the second consecutive day of protests against economic woes and the dictatorship of the Iranian regime, demonstrators clashed with security forces. The regime has dispatched special forces to quell the unrests, but hasn’t been able to control the situation. The protesters are chanting “Any Iranian who remains silent is committing treason” and are calling on their compatriots to support them in their cause. Security forces attacked the protesters to disperse them, but the demonstrators confronted the police and resisted the crackdown. Protests continue at this hour. "Proud bazaar merchants, support us"
Yesterday, a large group of people gathered in the city’s Amir Kabir industrial district (renamed to Shapur) to protest against increasing prices, continuous power outage and the corrupt policies of the Iranian regime, including its costly meddling in neighboring countries. The protesters denounced the regime’s promises as hollow lies. Workshop owners in Isfahan held banners in protest to high prices and their economic difficulties. The Iranian regime has dispatched a large contingent of its suppressive forces to control the situation. But the protesters confronted security forces and continue their protests. Isfahan is one of many cities that have seen continues unrest since nationwide protests erupted across the country in late December. In recent months, the farmers of Isfahan have also been protesting against lack of access to water and the regime’s corrupt management of the country’s natural resources. NCRI – On Tuesday, April 10, farmers and people of Isfahan staged a major pre- announced protest rally. The new round of Isfahan farmers’ protests began in the last weeks of the Persian year. Against being deprived of their water rights by the regime. They also chanted against the security and counterinsurgency forces that lined up to them and shouted: no fire arms, machine guns and tanks will be have use. According to the the state run IRNA news agency, the Eastern regions of Isfahan comprises of cities and areas such as Ziar, Jarqawi, Varzaneh, Ajeyeh, Harand, Khorasan and Kurdshan, which has a population of 300,000 people who are mainly farmers, but they are severely exposed to droughts which has caused them numerous Job and livelihood problems. According to the report, the fair share of the farmers in the East of Isfahan from Zayandehrud river water is about 400 million cubic meters, but this amount has not been allocated in recent years, and despite the flow of Zayandehrud river in a period during last year, only about 40 percent of the 100,000 hectares of Agriculture lands of this region had gone under cultivation. Meanwhile, according to the ISNA news agency, Hassan Kamran, a lawmaker from the Isfahan, criticized the Ministry of Energy on Tuesday for the water scarcity issue in the area and said: “For decades, Isfahan farmers have been looted of their water rights”. Earlier, reports and videos revealing the crackdown on protesters by repressive security forces of the Iranian regime have been published in March and also on Saturday this week. 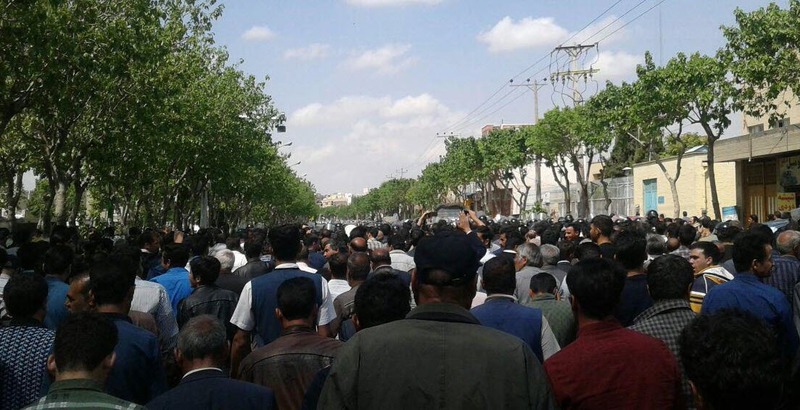 NCRI – This morning, April 9, a major gatherings and big demonstration of farmers in Isfahan has started in response to a cessation of their rights to water. The presence of women in these demonstrations is noteworthy. By blocking the marching path of hundreds of people and farmers in Isfahan, the security forces tried to control their furious protest. 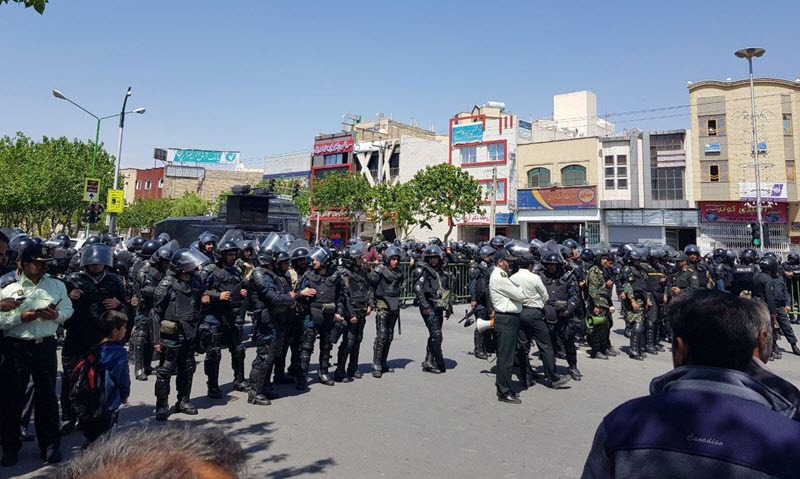 Police forces and other security organs at Masjid Ali Isfahan crossroads have been cracking down on protesters’ demonstrations against water scarcity. Machine gun tank tank no longer works. and : You liar Rouhani, what happened to our Zayandeh roud river? It is noteworthy that Today is the 53rd day of the protest gathering of farmers who are demanding their water rights. The day before, Varzaneh farmers also protested on their 50th day of protests by lining up their tractors at the entrance to the city against denial of the regime their water share and abandoning the agricultural land in the region, which is the only way to ensure their livelihoods. The poor farmers of the eastern cities of Isfahan province have been protesting for 51 days in various protest actions, including lining up their tractors, gathering IV front of the regime’s governorate in Isfahan, gathering and demonstrations in Khaju Bridge and demonstrations in different streets of the city, and confronting the regime mercenaries. On the last Friday of the Persian year 1396 (March 16, 2018), the protesters went to the Friday prayers show and by turning their back to the criminal mullah rendering the show, chanted slogans saying: ‘Back to the enemy, toward the homeland’. During the protests, a number of protesters were detained, whose release is one of the demands of the protesters. The Iranian resistance salutes the honorable farmers of the eastern cities of Isfahan and calls on the people of this province, especially the brave youth, to show solidarity with these protests and to support the just demands of the farmers. The protests of thousands of desperate farmers from cities of Varzaneh, Sarshiadoran, Ejiyeh … With the support of the people of Isfahan became more widespread on Friday. Protesters attended the Friday’s prayer show in the city during their march. In response to the nonsense talks of the speaker of the Friday prayers, they turned their back to him and heckled him, chanting, “First clear our situation then the Friday prayers can begin,” and interrupted his speech. Demonstrators were chanting at the time of their gathering in front of the regime’s radio and television: “Our disgrace is our TV and Radio”. 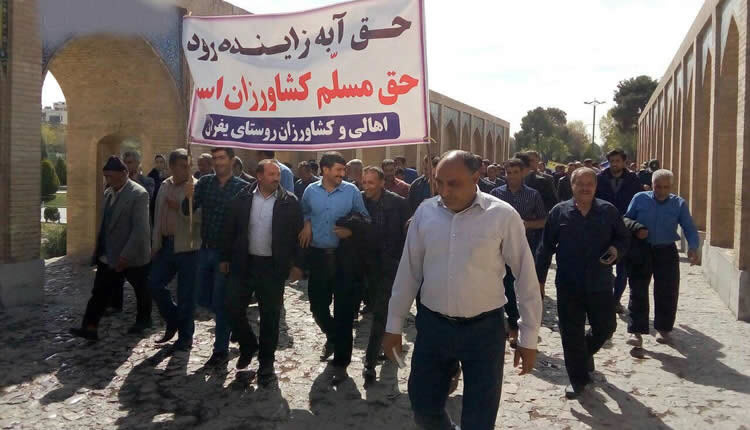 The protests of Varzaneh farmers began on February 16, and since February 28, they have been rallying in front of the Isfahan governorate, which spread with the support of people of Isfahan and farmers in the eastern regions of Isfahan.